Enriching and motivational stories about those who love and participate in tennis over the age of 50. This is a volume of senior tennis through the stories and experiences of senior tennis players, from Gardnar Mulloy and Betty Eisenstien and Mayor David Dinkins to unknowns such as Chuck Niemeth. "Here is a book that must be read by everyone who celebrates the best of all lifetime sports. Judy Aydelott has reached out to both renowned players and those who are less well known, and the common thread that runs across the pages is the enduring passion they all have for tennis. 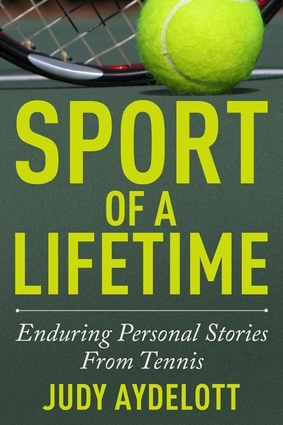 Yet Aydelott's superb and poignant book transcends tennis; it is equally about the larger game of life." - Steve Flink, tennis historian, author of "The Greatest Tennis Matches of All Time"
Judy Aydelott was raised on a dude ranch, later a farm, attended public school until her senior year and graduated from Abbot Academy, Andover MA, from Smith College and from Pace University School of Law. She became a trial attorney in the field of medical malpractice, a legal analyst for Court TV, a candidate for U.S. Congress in 2006 and a director of NYS chartered commercial bank. A tennis latecomer starting in her twenties, Judy is married to Gordon Aydelott, the mother of two daughters, and proud grandmother of five grandchildren.